So moving on along at a slower pace than I did last year, I am thoroughly enjoying updating my Home Management Binder. I am adding more forms this year as I update it. Organizing for long term use is about slowly making changes so that we stick with it, and then the changes become a habit. 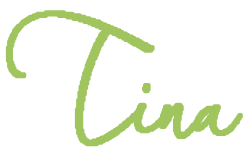 It is not about having anything "done", and I think that is where folks who struggle with organization get overwhelmed. By no means do I want to discourage you though if you are overwhelmed with organizing because you may want to check off "done" things on your list. What I am saying is that organizing is a slow ongoing journey. For sure there comes a period where managing your house and homeschooling becomes easier. As you declutter or organize you can check off big projects, but like anything else in our lives, it has to be maintained. It is so much easier to do it in bite-size pieces too. 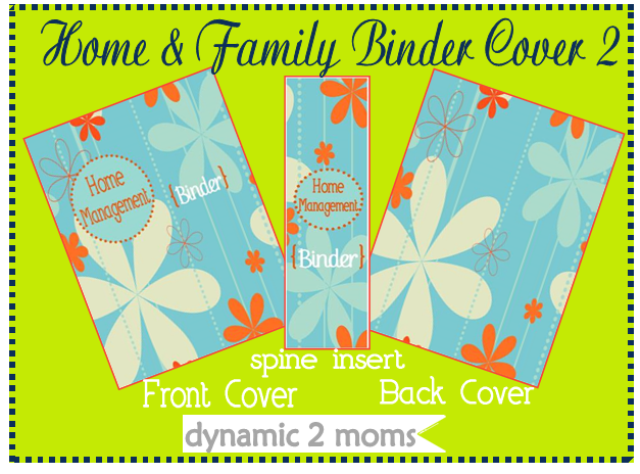 The secret key to organizing is making a "return trip" so that the clutter does not build up or in our case with the Home Management Binder, we give it an updo. I think it's normal to love doing "return projects" a little more than to do them originally but on the other hand there is so much more satisfaction when we first tackle an extra big project. That initial over the top high I get when I have thrown away all clothes that I don't wear is hard to come down from. I am eyeballing my kitchen next. I have some utensils in my kitchen that I have not used in 2 years. My rule use to be if I have not used them in 5 years it gets tossed out, but that is way too long. Two years tops is my new rule for kitchen utensil clutter. 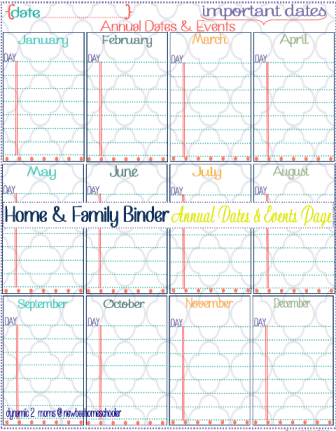 Back to updating our Home Management Binder, I have the new calendar pages done. 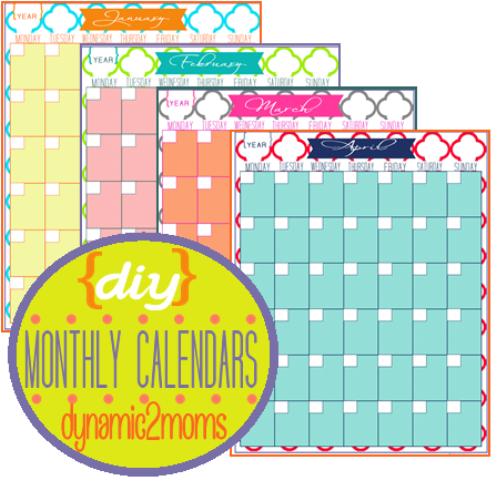 These are diy calendars that we can use again and again and they will go in our new "calendar" section of our binder. 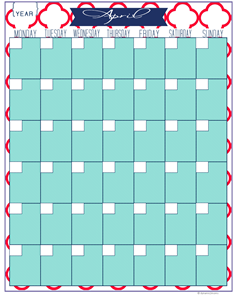 One thing you will notice a bit different about these blank calendars than most other forms is that it does NOT contain 4, not even 5 rows. This one has (6) rows. Yep, sometimes the 5th week is split and you need 6 rows. Look at March, it was a month with a 5th week split. A small thing to some people but not to me when you can't use the calendar. So all my calendars have 6 rows so we can actually use them and not just look at a form we can't use. If I don't need the 5th or 6th rows on some months, I will use it for some note taking. Just wanted you to know that fine point that gets under my skin about some forms that don't pay attention to details. Too, when it comes to choosing colors for my printables, I tend to have an out of body experience because you can never have enough color or patterns. Print off what you need now or print off all of them. Remember I print my pages on regular paper because mine go into page protectors. 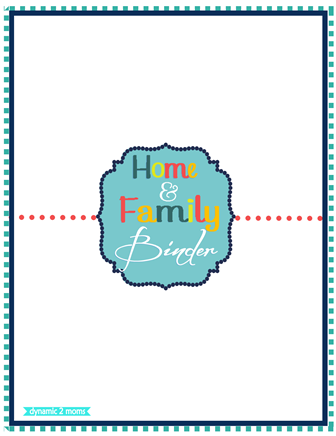 As always, my printables stay here on the blog for you and as I get time I release on the New Bee Homeschooler website for visitors. 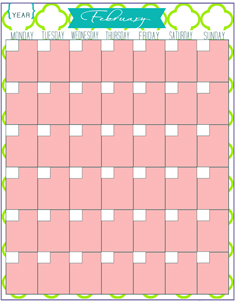 So you can find the most up to date printables always here on my blog. 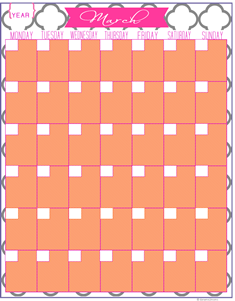 Download the 12 month diy calendars here. I am feeling all giddy about getting rid of clutter, spring cleaning and new printables for our Home Management Binder, so this quote has me inspired. "Life is all about timing... the unreachable becomes reachable, the unavailable become available, the unattainable... attainable. Have the patience, wait it out. It's all about timing." 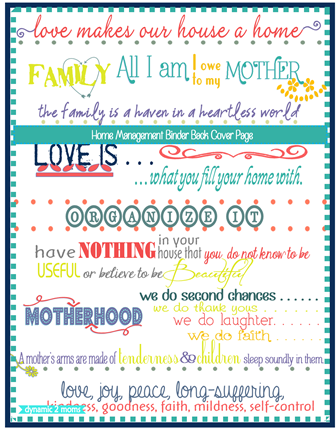 If you missed the other posts for the new printables for the Home Management Binder, you can grab them below. There are 2 new Cover Choices and another page for the Calendar section.